For several years now, I have been proud to call the delightfully eccentric, intelligent, all around impressive Duke Stewart a friend. Our acquaintance began around The Maple Leaf Bar and other nearby local haunts. Soon, my fiance and I became regulars on the invite lists to his exceptional parties. Duke does not use catering services to feed his armies of party guests; he prepares delicious, homestyle New Orleans style cooking of these proportions himself because he enjoys it, as he does the soiree itself. Over the last two years, during Krewe Of Oak events such as Mardi Gras and Midsummer Mardi Gras along with other festive occasions, Duke has provided an all-encompassing display of lights, lasers, projections, and other interactive visual effects perfect for a well-spirited dance floor and or party. I was fortunate enough to borrow some of this incredibly active and productive man’s time to learn a bit more about the experience his works provides those surrounded by it as well as more (as one will always hope to know) about Duke Stewart, the iconic person, and a great guy to know. M: How long have you lived in New Orleans? D: Born and raised here. I did move away and bounce around a bit when I was younger but I’ve been here most of my life. M: What part of town did you grow up in and where did you go to high school? D: Pretty much grew up here in Lakewood, in a house just a few blocks away and went to Jesuit high school. M: Nice, my dad went to Jesuit. How old were you when you first started getting interested in lighting and electronics and how did your first experiments with it go? D: Well, I grew up in the era of video game consoles; I had an Atari 2600 and all that. So basically, I’ve always been messing around with computers and working with 3D modeling and animation. Probably about four years ago I started incorporating projectors. The laser stuff was like only in the last two years. So for Midsummer Mardi Gras, I added these large blacklights and incorporated that into the setup as well. The blacklights go well with the lasers because they don’t kill them like a bright blue, red, or even white LED would. M: What was your first public lighting/visual effects display? D: Well, it was about three years ago at the Maple Leaf Bar, for a Krewe of Oak event. I got the OK to do the lighting effects and then I just kinda went to town with it and it turned out really well, people really seemed to dig it. M: Very cool; I was there and I would say it definitely added a lot to the vibe of the night. M: Do you think any particular genre of music you think is best accentuated by lighting? D: Definitely any type of electronic music for sure, you can’t go wrong with that. But it also goes with, say, some good old New Orleans funk. It’s pretty badass. M: Ohh, yeah, no doubt, it’s actually been too long since I’ve seen a good funk show, I think I’ll need to make that happen again sometime soon. Do you have a favorite show that you’ve done that stands out in your mind as being particularly fun or memorable? D: I’d say the last Midsummer Mardi Gras, that’s a pretty easy one to answer. M: Here’s an off the wall question: If you owned a restaurant, what kind of food would it serve and what would it be called? M: If you could add any piece of equipment to your visual displays regardless of price what would it be? D: Probably a projector big enough to hit the side of a building because you can do a lot with that. I mean, you could do some killer stuff for White Linen, Art for Art’s Sake, and all kinds of different events. You could project on the side of buildings in many locations for all kinds of different functions, there’s so many to choose from, that’s the great thing about New Orleans. M: Do any stories come to mind where you’ve seen or done something and quietly thought to yourself…“Only in New Orleans”? M: Yeah, I’d have to agree with you there. If you had the chance to do lighting for a high profile show or venue what would it be? D: I’d say Jazz Fest or Voodoo Fest, either of those would be a lot of fun to do. M: Are there any events of the past that you would like to have gotten the chance to incorporate your visual displays into? D: I’d do Woodstock, as long as I could keep the equipment from getting rained on. M: Yeah, probably a slight electrocution risk there. 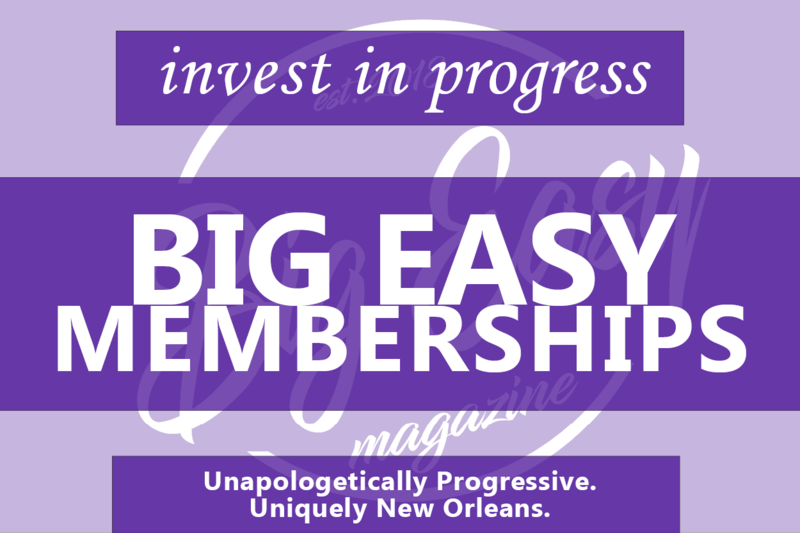 (Both laugh) Would you like to promote any upcoming events or make any general statements to the readers of Big Easy Magazine and the people of New Orleans? D: If anyone is interested I’m available for any size parties and events, they can call Technomancer at (504) 265-8310. I will certainly bear that information in mind, possibly for my wedding. What Duke Stewart brings to any party, musical, or otherwise convivial setting is something that will surely put your event or venue both in the history books and on the map. Be sure to check out some of Margaret’s previously published reviews for local favorite spots and creatives like Thomas Thoreau and The Neutral Ground!